Congrats Lacey. I also did not think the bridge was too bad. My biggest complaint was the sea of runners that I had to pass during much of the race. It was very difficult to move and keep any sort of rhythm/pace. 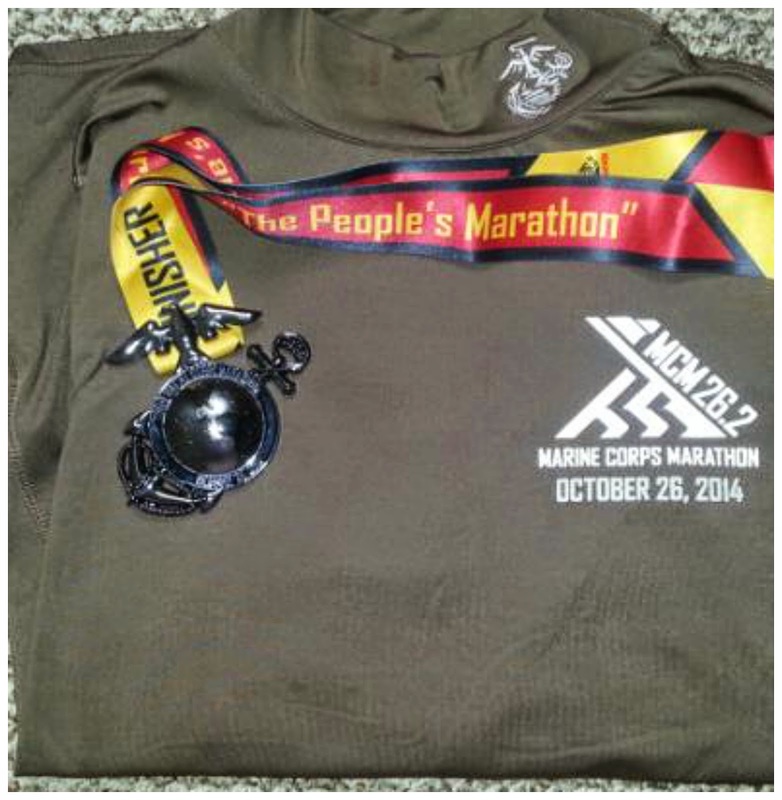 Lesson learned, have absolutely no goal during a big marathon. Thanks! Congrats to you as well! Yes it was hard at times weaving around other runners to find your pace. Congrats! I would love to run tis race one day. It must be an incredibly moving race too. Thanks! Yes, it really was. Congrats Lacey--you know how much I love this marathon! I love hearing people's accounts of it. I actually loved the bridge when I was running it--kind of a time to collect and reflect, you know? Thanks! And now I know why. Exactly! Thanks for stopping by today. I don't study the course map either. I might look at the elevation details and if it's hilly, then I'll do more hills when training. Congrats and I am glad your IT band held up ok! Yes, I am very happy it didn't give me any problems. Even if I know it has hills I never incorporate them into my training. I know I should! Awesome job, Lacey! The last few miles seem SO long! Super cute jacket too! Thanks! I wanted to get the blue one but they didn't have it in my size, and I found it was for the men's anyways. I usually look at the course map, but I usually find that my experience actually running the course is different than what I had expected it to be! Awesome job!! Yes, it always is so why stress yourself out with studying the map. Congrats Lacey! MCM is such a great race. That hill up to Iwo Jima Memorial is tough after both the 26 miles and 6 miles! (I've done both the marathon & 10k in past years.) Crystal City is one of my favorite parts of the race as a spectator. Thanks! Yes the last .2 was a killer after already running 26. Congrats on MCM! I have some friends that ran it this year. I definitely study the course map. I like to know everyyyyything. Thanks! I feel like even when reading it you still don't know until you are actually on the course. I guess I like being surprised. And I sure was at certain points. Keep up with that foam rolling! I study the course so I have an idea of what to expect, but it's mostly for water stations and possibles port-a-potties, if I need them. Yes I am. It has been helping. Foam rolling, epsom salt baths, and ice. I also got a massage yesterday and It was lovely. Congrats on the finish and yay for the IT band not acting up! I try to get as much information on the course as I can as I like to know what's coming and what I should be prepared for, especially hills. Thanks. Yes I should've looked up those hills. I had no idea about them in the beginning. Congratulations! I'm glad your IT band let you have a good race. I like to read race recaps and check out elevation charts so I have a general idea of what's coming, but I don't study it too closely. Thanks! I am happy it didn't act up then. I am still dealing with it now in the recovery process. HA, that sprinkler! I was like IF THIS WATERLOGS MY PHONE I WILL NOT BE OKAY. Haha I know right! I think that may be one of the reason I got blisters. Wet socks! Walt Disney World is a great marathon. You will have a blast! Congrats!!! I am bummed I didn't see the magnets when I went to look at the merchandise! I'll have to pick one up next year when I go to the expo earlier!! Congratulations!! Iike reading the different experiences at MCM. Thanks! You too! I agree. 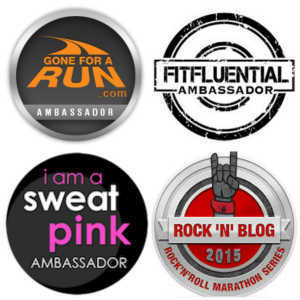 Everyone has a unique story of their own to share about the race. congrats! interesting that you didn't like the sprinkler -- i talked to tons of runners who loved it! your body must do a good job of keeping you cool :) i love reading all the recaps - wish i would've seen you while i was spectating! Thanks! Wish I would have seen you too! Yeah I was not a fan of the sprinkler. I didn't think it was hot enough for that. I was pretty chilly for the next mile or so. Congrats! Finishing a marathon off of one 15 mile longest run is great! I like to drive or run the course, or at least part of it, so I know what to expect before the race. I'd like to run this race someday! Thanks! It really is a great race! I think I actually do better when I don't burn myself out from training so much. So this worked out great! You did great!!! 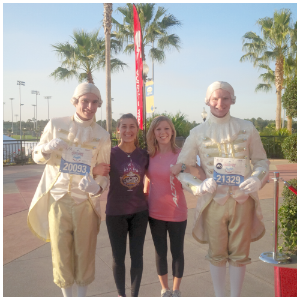 What an experience, too - I hear the MCM is one of the neatest marathons to run. I like to look at the race course ahead of time, but I'm bad at checking elevation, so I still end up being surprised by the hills. Thanks! Yeah same here. Numbers don't really do too much for me. 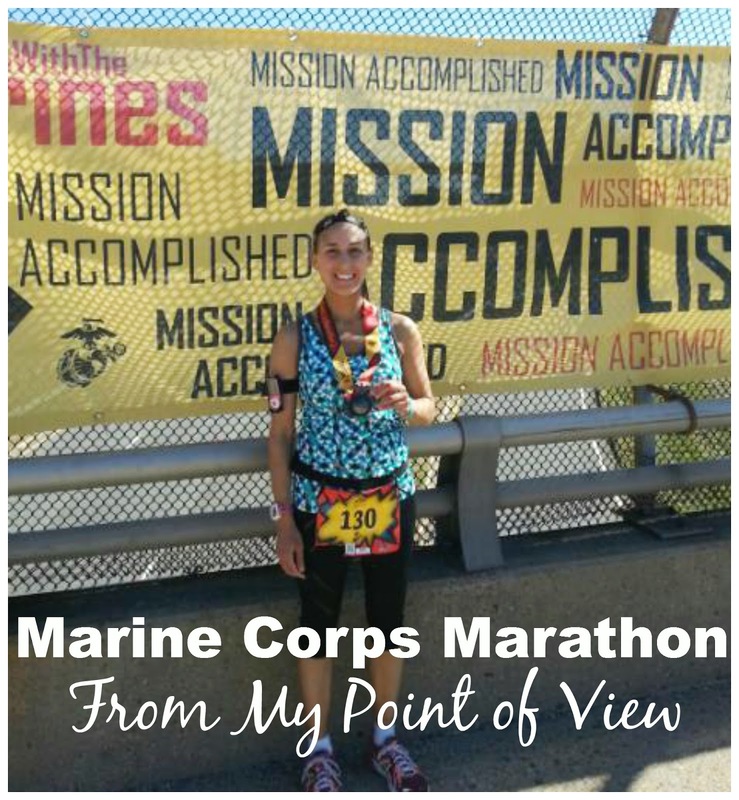 Way to go on completing the marathon! 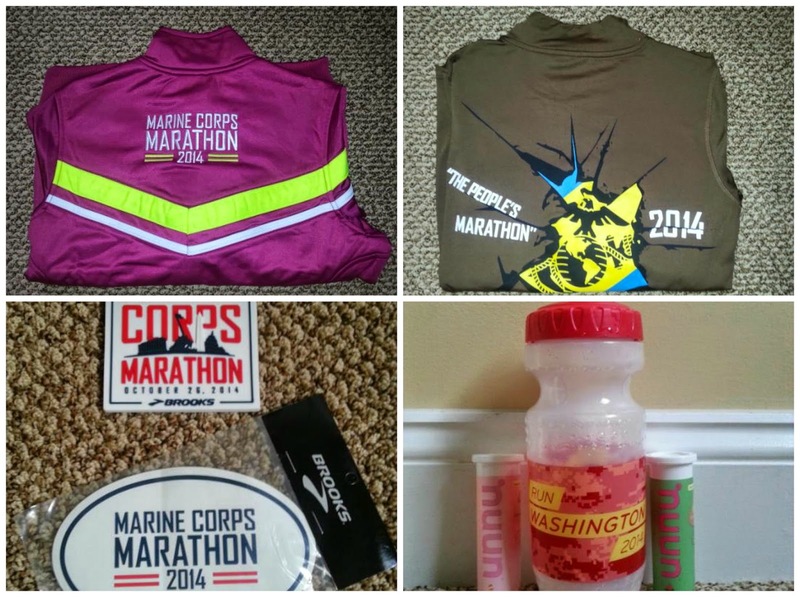 I'd love to do the Marine Corps Marathon someday! It's definitely a bucket list race for sure! Congratulations! You finished and that is always good. This race is definitely in my bucket list for sure. Those hilly sections sound scary though. Thanks! Well there was no doubt that I wasn't going to finish! Congrats!!!! I've heard that is such an amazing race! So glad your IT Band behaved for you during the race! Thanks! Yes, I'm so grateful it didn't act up during the race. Congrats Lacey! The bridge is included in the course for so many DC races, including Army Ten Miler. I think so many people dread it because it just seems like its never going to end (or at least that's how I felt a couple of weeks ago). Thanks Kathryn! Yes it did seem never ending. But wasn't too bad. Congrats! Sounds to me like you did awesome, especially with those last tough miles. I had heard from another friend how tough that last final hill is! And she also told me about the service dogs at the expo. Glad you got a picture! :-) Congrats again! YAY Congratulations Sounds like overall it was a great race for you. I am so hapoy for you that you IT band was fine for ya. I do the same as you I never really look at a course map either, dont like to worry I rather be surprised. Yes, I don't remember any small hill in the middle so they must've removed it. But the ones at the beginning and last .2 were enough. Great job, and so glad you were able to finish without your IT band acting up. Congrats!! Been so excited to read everyone's MCM recap. 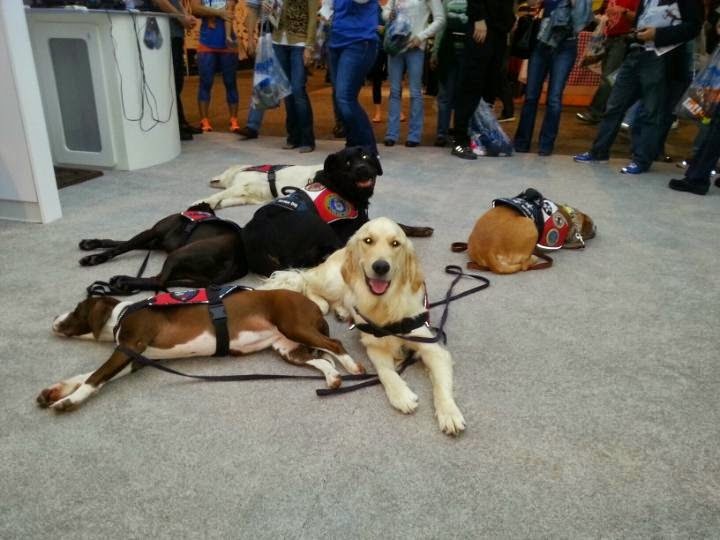 That is really neat that they brought service dogs to the expo. I usually study course maps ahead of a race - I think it is a control thing for me hehe. Hope you are enjoying some rest! Congrats on a great finish! I rode by the crowd about 4 and half hours in and remember thinking it felt pretty hot! I hope your IT band doesn't get to cranky. Enjoy the recovery :) What an awesome medal. Great recap! I can't wait to see how you do at Vegas. Congrats on a great race! I love reading all the race recaps and it sounds like it was a great race overall. I like you don't usually like to look at race maps, it just adds to my anxiety, so in most cases, ignorance is bliss! Congrats! Glad you had a good run. I did take the munchkins :) They were delicious, I was needing salt desperately at that point too, so they hit the spot. Sorry we didn't get to meet up!! Usually I like to have the race be "new" to me, I just look for elevation on the course map. The marathon that I just completed, I ran the 13.1 loop as practice because I was trying to BQ--It was also familiar to me because we used to live in the town. GREAT JOB! would you run it again? I really enjoyed the race, however there are so many great ones out there I don't think I would repeat it. Congratulations Lacey!! I never study course maps, I just like to be surprised. I'm so glad your IT band didn't bug you during the race! Congrats!! I'm so happy your IT band didn't bother you during the race. I always study the course, but I agree with you that you don't really know what it's like until you're running it. And it's funny how the supportive things spectators say do the opposite of making you feel good after you hit a certain point! Hey there! I just came across your blog post because today I got into my first MCM! And my first marathon!!! Which hotel did you choose? HI, I think maybe it was the Holiday Inn. It was close to the Start (not quite a mile) and it was only a subway ride away to the expo. Congrats on getting into MCM!